The only way I see myself escaping my student loan debt is to kill myself. I want you to read that again: The only way I see myself escaping my student loan debt is to kill myself. Reading that sentence gets me emotional. I can sense the pain. I can feel the despair in the words. It creates a tightness in my chest as I hold back tears thinking about what that means. You can sense the burden that is on her shoulders thinking that the only way out is to end her life. Isn’t that the most horrible thing you’ve read? You want to know something, though? I’ve read that sentence twice this year talking to readers here on this site. And the truth is that there are many more people out there than two readers that reached out to me. People that we haven’t necessarily connected with, but maybe will find this article and feel a little weight lifted off their shoulders. I’m going to be straight with you on two levels. First, the emotional level, and second, the factual money level. Suicide is never the answer because there are countless people who love and depend on you. Your mom and dad. Your brothers and sisters. Maybe your children. I know that today you think you’re going to do them all a service by taking away a “burden”, but I promise you, you being gone will be a 1000x burden and will cause more pain and sorrow that you could even imagine. No amount of money is worth your life. You can live with student loan debt. You can smile with student loan debt. You can play with your children with student loan debt. Ending your life is not the answer. There are countless ways to deal with your student loan debt, and there are countless people that can help you navigate the confusing and frustrating world that is student loan debt. But that’s gone if you take your life. However, if you have a cosigner on your student loans, like 90% of private loans today, if you die, your cosigner (typically a parent) will still have to pay the debt. So, in situation #1, with Federal loans, you’re not a burden. It might seem tough for you today, but you’re not impacting anyone else. In situation #2, if you die and have private student loans, your parents could still owe the debt. And with you gone, how are they going to pay it? You’re really leaving them with a burden that didn’t exist before. Now, let’s talk about your loans for a second, because we know that they are the driving factor of your despair. Being burdened with a debt that you don’t think you can ever repay is crippling. You can feel like your debt is suffocating you – both mentally and physically. When you’re deep in debt and feel like you have no chance of paying it back, and the phone is ringing with collectors, and you’re getting mail, it’s a dark time. But there are several easy ways to get help for your student loans. Follow this simple action plan. Step 1. Call Your Lender. Too many people are afraid to call their lender. But what nobody seems to realize is that student loans are owned by the government, and managed by student loan servicing companies. These companies are paid for managing the loans – including by helping borrowers stay current. They are actually there to help you. Yes, it’s a call center, and yes, you might get a rep that’s not very helpful. But many are, and most will be able to point you in the right direction. Step 2. Immediate Relief With Deferment Or Forbearance. If you simply need relief right now and can’t make a payment, ask for a deferment or forbearance. This will allow you to not make payments for a certain amount of time. You don’t want to do this too long, because your loan balance will continue to grow. Step 3. Get On An Income-Based Repayment Plan. These are the best repayment plans for Federal student loans if you’re struggling. They will make your payments 10-15% of your monthly income, or less if you’re close to or below the poverty line in your state. So, if you have no income, your monthly payment will be $0. And that $0 per month payment counts towards student loan forgiveness. That’s a win-win situation right there. If You Have Private Loans… If you have private loans, there are less options, but there are still things you can do to get help. Some lenders offer programs very similar to income-based repayment and deferment. You can also look at refinancing your loan, which could lower your monthly payment. We break down all the options for private student loans here. And please, please, make sure you avoid these common student loan scams. When you’re the most desperate for help, that’s when people and companies prey on you. It’s easy to become a victim when you’re already hurting inside. If you or someone you know is struggling, please reach out to a counselor. If you or someone you know is talking about wanting to die or kill one’s self, feeling hopeless or like they have no reason to live, feeling trapped or having unbearable pain, or think they are a burden to others, please reach out for help. You can call this hotline and talk to someone 24 hours a day: 1-800-273-TALK (8255). If you see a post on social media, don’t ignore it. All of the major social media sites include ways to help a friend in need. You can also check your local college to see if their graduate program in counseling offers discounted sessions. Remember, you’re not alone with your student loan debt. But no matter how you’re feeling about your debt, your friends and family need you and care about you more than you could ever realize. P.S. I encourage you to share this article on social not for me, but maybe for someone who is suffering in silence and this article may benefit. You don’t want to learn about it after it’s too late. Please share as you see fit. This just shows how far out of control student loan debt has gotten. It’s amazing that when tuition goes up higher than the average wage increase for years and years that nobody could understand this would be the result. It’s tough to be burdened by any debt, not just student loan debt. Student loans have the problem in that the collateral is your personal earnings, so it really can take a bigger toll on borrowers. Much like alot of things, i currently feel there’s no hope. Even if I qualify for student loan forgiveness, i don’t have the money for payments to enter the progam. I just don’t have the money, and my credit is bad already because of student loans. So i can’t borrow any money. Check out these “secret” student loan forgiveness programs that are part of your income-based repayment plan. If your income is low enough, your actual payment could be $0 per month, and you’ll make progress towards forgiveness. Find out here: Secret Student Loan Forgiveness. I love when people say if you enter an IBR or PAYE plan your payment will be low, it can even be $0. Like that is some saving grace. Uh… wake up, 20-25 years and the interests keeps piling up. When the loan is forgiven, the amount that’s forgiven is sent to the IRS– whom will tax you on the amount forgiven. If you can’t pay that, then you go into a payment plan with the IRS. Can’t pay that, you enter an offer in compromise application with the IRS, which mostly ends you up in court finally able to declare bankruptcy at the ripe age of 50-60 years old. You think you can escape? Wrong! You’ll be paying the interest off for the rest of your life with nothing going towards the balance. Articles written like this need to have more research on how someone can cope with student loans instead of hiding the real facts. 1. Move back home if you can. Family is family, and they will always love you and help you out in troubled times. 2. There is a massive movement of Vandwelling. Don’t look at this lifestyle as a negative but more of a positive. Life’s an adventure, student loans place you in a mindset of a mental jail sentence. Break free! 3. Side hustle if you can like Uber, Nightshift gigs, online work like Upwork. 5. This one is a bit extreme but leave the country. Start completely fresh. The more people that do this, our government will start to recognize this because it will become an economic crisis. I’m in the same situation as so many people out there with loans. Student loans are the biggest scam to hit America and continues to rise. We hear there are no guarantees in anything, but if I had money to invest in, I would invest in student loans because lenders don’t lose! Hi Shane, love the ideas 1-4, but don’t dismiss income-driven repayment plans. There will be people that still face large liabilities, but we’ve usually seen these cases where people were small business owners taking advantage of their business and other vehicles to artificially lower their AGI. conservative numbers say college costs have risen up to 900%, while wages for a white male have gone up only 165%. I appreciate what you wrote here because I am kind of feeling the same way with my situation. I have never really considered killing myself, ever, but that is literally the only way I would be able to rid myself of the hardship that these student loans are bringing down on me. I am a little disappointed with most helpful posts about student loan debt because for me, I have mostly private student loans… about $175k worth of it ($50k of gov debt). Nobody seems to have anything much to say about them. Why? From what I’ve seen, it’s because there is nothing helpful to say about them. There is no help at all. No income based repayment or anything to aid the debtor in his repayment during times of hardship. Except for maybe deferment or forbearance which isn’t exactly forgiving. It takes all the interest that isn’t paid and adds it back to your principle. Also, there is NO WAY OUT. There is no bankruptcy protections on student debt, Gov or private, and it makes no sense. They are punishing people that are trying to better their lives through education by taking away any form of consumer protection. This has created a harmful predatory environment and takes advantage of the students by making them a captive audience. Bush and his administration should be ashamed for creating this type of toxic environment for students. He is the one that took away our bankruptcy protections from private student loans in 2005. The tough part with private student loans is that they function much more like a car loan or mortgage compared to a Federal student loan. However, the collateral on the loan is your earnings. Having about $125k in private student loans is tough. I’m guessing that you were thinking about going into a higher earning profession such as medicine or law to have such debt. 1) To refinance your loans and take advantage of the low rates available today. You could also refinance into a potentially longer term to reduce your payments today. We recommend using a comparison tool like Credible to shop for different loans. 2) Earn more money. This one sounds tough, but it’s completely possible if you’re willing to put in the time and effort. This is my personal story and why I’ve started focusing so much on extra income. I side hustled through high school, college, and even today with this website. I started earning just a couple hundred extra dollars per month, and now make thousands per month on the side of my day job. It allowed me to pay off my $40k in student loans in just about 3 years. So don’t dismiss this as an option for getting out of your private student loan debt. As an aside, make sure you are taking advantage of IBR or PAYE for your Federal loan portion. The sick part about student loan debt is the outright removal of almost all consumer protections (in favor of the predatory loan servicers). This was done by our benevolent government. They are exempt from Truth in lending, Fair Debt Collection, bankruptcy, etc. The only light for the predatory private debt is statute of limitations, which does not apply to federal debt. Look into that option. 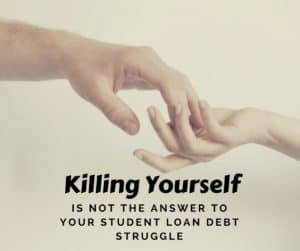 I found this site because I have thought about suicide over my wife’s student loan debt for a couple of years now. So much so that a year and a half ago I purchased life insurance sufficient enough to pay off her student debt and our home. My policy does not pay out for suicide within the first two years of the policy so that period will be ending 2/2017. Not sure I would have enough guts to go through with it or not but I guess we’ll see how things go over the next few months. There are a lot of options to help with your loans. You killing yourself is not one of them. You would seriously make your wife’s life so much harder and not to mention kids, family, etc. Trust me as someone who survived a family member’s suicide, it’s worse for the people you think you’re “helping”. I think about killing myself daily or hope to get a terminal disease so I can live out the end at peace. My husband and I took out Student loans together for our daughters and he divorced me and stuck me with 200,000 in debt with these loans since I’m the one who signed on them while we were married. Please realize that those thoughts aren’t worth it. Your daughters need you, and this debt isn’t worth your life. Please consider getting help for these thoughts as it sounds like you’re going through a lot in your life. What schools don’t tell you it that without experience your not gonna get a job in your field. Alot of false claims and empty promises!! Your advice might apply to federal student loans, but is of no relief for people with private student loans. Private loan companies are under no obligation to cooperate with borrowers. Income-base repayment plans are not available for those with private loans and the debt is not dischargeable in bankruptcy. Death is the only way to have private loan debt forgiven, however with cosigners or parent loans, they might still harass your family after death. ok, I want to kill myself just haven’t worked up the courage yet. I do know how I will do it, but the time is not right yet. Most likely I will end it with a hike in the mountains induce hypothermia take some pills and die. Once you get hypothermia you don’t realize what is happening so it becomes a painless death. No mess mess for others to clean up. Just back to the earth. But like I said I am not ready yet.I appreciate your suggestions but they don’t help. I owe 250,000 I am in REPAyE and I have 9 years to go in hopes they don’t break there promise of loan forgiveness. I pay 500.00 dollars a month and that is the cheapest I can get away with. They have already miscalculated the payments and won’t count three months toward the forgiveness because of errors on their part. I contacted my senator, the student loan ombudsmen office, the loan servicer and the Consumer protection bureau. The senators office said there was nothing they could do, the ombudsmen wrote a very poorly written letter that i did not understand, the loan servicer admitted to their errors but refused to do anything and never responded to my letters and finally the CFPB just took note and said they couldn’t do anything. So here I am feeling like I have no protection and live in fear if I default as to what would happen. Suicide seems like a real option to me when I have no rights and live in fear of the department of education. Go figure. School was the biggest mistake I ever made. If I could redo school wouldn’t have happened. I would have found another way. Cheers! I hear you are in pain. Your student loans will be forgiven under RePAYE regardless of the payment snafu. You need to talk to someone right away. Call 1-800-273-TALK (8255) (the National Suicide Prevention Lifeline). Thanks… but sitting back and listening to Radiohead seems to help with the Blues. Fake plastic trees by Radiohead seems appropriate for me today. I just have to remind myself not to depend on the government for anything. That way I never owe them. I’d be truly free from this form of servitude called student loans. I totally agree. I have 3 grad degrees. PSLF based on gross not net pay. After bills I can’t afford the payment. I take classes (free) to stay in deferment. No kids, no spouse, parents deceased. I stay alive for my dog. When she goes, I go. I’ll never be able to retire. No future without FedLoan taking my SS and pension. Was supposed to be a psychologist. University deceived me; can’t get licensed with my clinical psych degree! Now I teach at a CC. You need to talk to someone right away. Call 1-800-273-TALK (8255) (the National Suicide Prevention Lifeline). Hi Mary, I hear you are in pain. While dealing with your loans and job can be tough, there are options that can help you. But you need to talk to someone right away. Call 1-800-273-TALK (8255) (the National Suicide Prevention Lifeline) and chat with them. So here it is: I’m 38, married, 1 eaight year old daughter who has survived leukemia. Combined $130,000 in student loan debt, plus medical debt, etc. After rent on our horrid apartment (after we lost our house) in the ghetto of a terrible small town, we are overdrafted. We have a stack of collection letters, past due statements, legal action threats, etc. and can barely feed or clothe our daughter. Zero help available. Zero. Getting through my days is luck. I think of suicide so much that I’ve actually planned it. I dream about it, vividly. It is THE only way out. Period. Will never repay it and retirement will absolutely never happen. Another 40+ years of misery? Ya, no. Done. Sad thing is, I don’t even care. Not scared of it. Counseling? Why…it doesn’t pay off my debt. Calling suicide hotlines is pointless. You talk to someone on the other line that doesn’t know you and they pretend to care about you. I hear your pain, but there are ways to deal with the finances. You might look into bankruptcy to get a fresh start. You can get on an income-based repayment plan for your loans, and your payment could be as low as $0 legally. But today, you need to talk to someone right away. Call 1-800-273-TALK (8255) (the National Suicide Prevention Lifeline). Don’t dismiss it. Income based payment are based on gross pay, not net! Payments are not based on what is left over after bills! It doesn’t make any sense! Payments are based on your discretionary income, not just your gross pay. That includes the state you live, family size, etc. You need to look at your total budget because they are affordable for most borrowers. 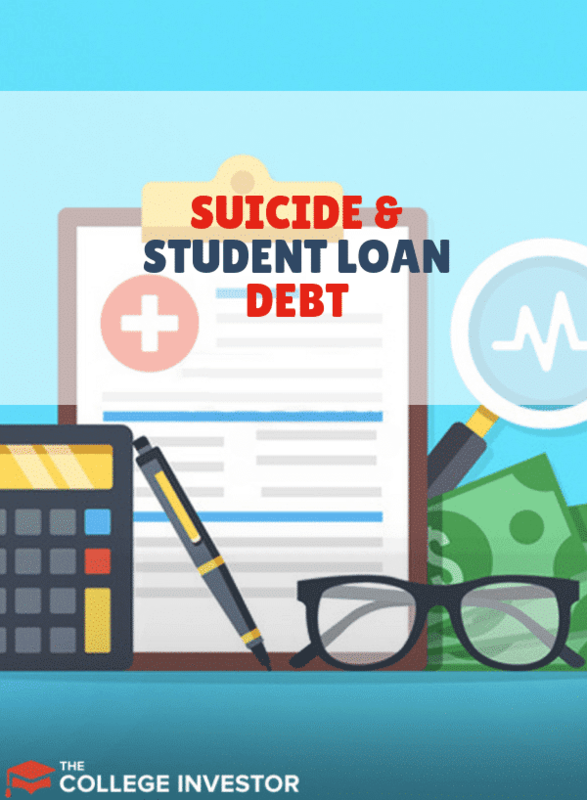 I am also considering suicide due to $90k in private student loans, the balance on which never seems to go down because most of the payments go to interest. I can’t get married, start a family, feel like a burden on my boyfriend and family. My credit is shot. I appreciate your earnesty in trying to provide hope for those in this situation. Yes, my parents consigned the loans and so that is the one reason I do not want want to die now and stick them with it. Instead I’m taking out a life insurance policy and creating a will which pay out to them after the suicide clause in the policy expires. If by some miracle I can land a higher paying job or my side hustle takes off (I’m still trying here) and I’m in a better situation over the next couple years, I can reconsider taking my life. If not, I plan to go out with a bang and would love some media coverage of my demise to help the rest of the indentured souls. Please talk to someone. Call 1-800-273-TALK (8255) (the National Suicide Prevention Lifeline). Your debt can be managed. Your finances can be fixed. Please reach out! I think about suicide all the time too. Between my wife and I we have $640,000 in student debt. She is a physician and I have a law degree. Tried practicing law and couldn’t make a living at it. Most of the people that graduated with me are struggling while a lucky few had parents or friends that gave them well-paying jobs. I too am looking into life insurance plans with favorable suicide clauses. Most men in my family have heart attacks and die in their early 50s and 60s anyway. Don’t know why I would work so hard to be enslaved the rest of my short life. I understand the argument of burdening others but at the same time, and in time, my wife can remarry after some time and live the debt free life she deserves. My son is too young to really remember me anyway. Sure, they’ll miss me for awhile but they’ll move on. There is no relief when you owe what we do even when she makes what she does. Education is a scam. I’ve got a few years before I commit the deed, and ideally that’s what suicide time clauses in life insurance aim to do–prolong the concept and hope the persons feelings improve should that be their purpose. But those feelings won’t change. The little we have is because of what my wife provides and I’m sick of robbing her and my son of the things they need. Seeking real help costs money that I’d have to once again take from my wife and my son. Going would alert her to my thoughts. I wish I would have kept my McDonalds job when I was 14–I’d be in a much better place. What a mess. It can be tough to deal with so much debt, but you need to talk to someone right away. Call 1-800-273-TALK (8255) (the National Suicide Prevention Lifeline). I’ve been so close to suicide before, at least twice in my life, possibly three. First was ODing on prescription meds, second was actually taking one of my veteran brother’s guns, third was walking along railroad tracks. Sadly, each time I was deterred by the thought of my husband and parents being saddled with my debt. It was literally the ONLY REASON I am alive today. Not because of love, not because of a will to live. No. Because no matter how much pain I am in, to foist that onto my loved ones is completely unbearable. I’ve been practically homeless. I’ve been beaten down and dragged around and taken some horrible jobs with equally horrible pay. I went 12 years without any insurance and never knowing if I could pay rent or would get evicted (if we were lucky to have an apartment) or tossed out (by abusive roommates/landlord). Ramen is still a constant in my life, and even that has to be rationed out. There are little to no cheap/free healthcare options (especially mental healthcare options) where I live, even less within walking distance or walking distance of public transportation. Thanks to the abolishment of student loan protections, I literally hold no hope, and once again, I exist simply so my parents and husband won’t be saddled with my debts. The student loan system has created an army of walking husks, desperate to take any work. I just wonder how many of us are like that now? Sad to say, but I am glad I am not the only one thinking about offing themselves because of this outrageous debt. I worked so hard at school, got straight A’s and got to my dream university Oxford. I took biology. But apparently biology isn’t considered a STEM degree anymore. It really seems pointless, I can’t hold down any job that’s worthwhile. I just get this overwhelming feeling of hoplessness. I am autistic and i can learn everything there is to know to pass a test but actually fitting into work is impossible as it’s all about fitting into the work ‘culture’ if you ever want to get anywhere. I worked harder than most of my peers for 18 years of education and now I don’t even have a job, meanwhile the interest on my student loans is just increasing it all. EVERYONE told me a degree from Oxford of all places would mean the world is my OYSTER. As a young teenager I pushed through countless teary all nighters, sobbing through the school work because I thought ‘If i just keep trying a little harder, it will be worth it in the end’ if I make it. Well the dream came TRUE and I got the offer to study at the best university in the world. I was so happy I thought I had finally done it and all the hard work paid off. But I can’t be a banker or hold down any job because of my autistic social skills. My hopes were so high and now I just feel like I want to kill myself sometimes because i will never achieve the ambitions that I was conditioned to expect my whole life if I graduated from Oxford. My dream came true but after graduating the world is most certainly not my oyster and I feel trapped. I have no idea what to do about my student government loans debts. Can’t sleep just wish the the USA did not have these laws. Suicide seam like a good option but can’t even think of a way to do it. Maybe jump off a bridge. Asking money form my family seam so hard since am the first person in my family to even go to collage. I can see the disappointment in there eyes. After read this blog am going to ask for my family help. Don’t know what to do if they say no. There never really been there for me, but lets give it a try, butter then thinking of suicide everyday. The math of your student loan debt can be dealt with between you and your spouse. But you need to call and talk to someone now. You can call this hotline and talk to someone 24 hours a day: 1-800-273-TALK (8255). I think that this is the one time that your article would have even existed. I remember when certain state colleges were practically free. I paid off all loans on my BA in 3 years (and I thought that was tough!). I just got my Masters, at a ripe old age (never mind) and thought I had fairly high paying job in the bag. As fate would have it, I had a legal problem, and that job was withdrawn, and I was under investigation for a while. Okay, so I wanted to kill myself. I ran, not walked to a psychiatrist and got on pills to make my emotions calm down. Once they were sort of calm, I got off the pills because I do not like drugs. A year later, I am closer to having to start my loan payments, but also, closer to a reasonable job in the field which I studied for. The moral of this story? Just keep inching towards your goal, and don’t die. Yes, I had to beg for another deferment. But oh well, I guess being alive is worth that. I’ve taken out stafford and grad plus loans and have perhaps over 70k in debt trying to get through higher education but it didn’t work. It’s good to see I’m not alone in the struggle of what to do with my life. It’s not only the debt but also the time I’ve put in and the expectations of friends and family that make this very hard. I feel your struggle. While your student loans are a burden, it’s a solvable problem. But you need to talk to someone right away. Call 1-800-273-TALK (8255) (the National Suicide Prevention Lifeline) and share with them your struggle. I haven’t gone to law school yet. I am 25 and not getting younger. I have a few k in credit card debt but am thinking about getting a consolidation loan for this debt. But would that not hinder my chance of getting law school loans? On another note, I am saddened by all of these suicide comments but I feel your pain. Getting a personal loan to consolidate your credit cards is a great way to potentially lower your payments. As long as you’re not behind on any payments, it shouldn’t negatively impact you. By the end of this year, I’ll be gone. It hurts because I really don’t want to go. I’ve considered this for many years, and I’m tired of struggling with student loan debt. I owe approx 68k and can’t even afford the income based payments. I’ve had a hard time finding a job in my profession, because they are limited and I live so far away from the city where jobs are kinda offered. Deferement/forebearance, yep I’ve done them. I am now charged $15.00 per day in interest through Nelnet, who can afford that? I’ve called them and made arrangements etc. everytime I was making over $400 a month payments, my balance would go down maybe $15.00, wth?! There is no winning this, and frankly, I’m just tired of it, wore out. I have no more fight in me. My life insurance will cover the cost for my husband. I know I signed on for this, but have had some very hard luck in my life. I will terribly miss my grandkids, and daughter, and my dog. I can’t talk to anyone about this, I’m to ashamed. College tuition has gotten out of hand. I’m just tired of fighting the fight. Hi Lee, please speak to your husband about this, or talk to a professional. You need to talk to someone right away. Call 1-800-273-TALK (8255) (the National Suicide Prevention Lifeline). The financial aspect of your debt can be resolved. But your husband and children need you today. I’ve read your article, it’s thoughtful and concise– but doesn’t address everyone. I’m replete with MS, still working though. Not for long. With 180K of student loans, wages being garnished and threats to take away my SS, I have to say there’s not much more choices left. The SL people have nothing to say about disabilities, and getting on a disability is nearly impossible. Thanks to Obamacare [I know, it’s dead now] I couldn’t afford care. Without 2 years of consistent care under a Dr, disability will not kick in– never mind the MRI scans showing sclerosis all over the place. Ever try to pay for a $65k/yr medication (Gilenya) with a $12K deductible. Exactly. Basically, I just wanted to drop a line in defense of some people, such as my self, who choose to check out instead of living a life on the streets as a nearly-retarded, disabled individual. I call it mercy. I found this article searching the topic “What happens t my student loans if I kill myse?” It’s surprising to see others as stupid as I. I started a doctorate 7 years ago. Now I’m $500,000 in debt and no doctorate. I had a complete physical and emotional breakdown 3 years ago at school and lost my teaching job. Now, I’m struggling to feed my family selling cars. Ironically, I started this to help others as a behavior analyst. Now, I see no way out. I have been battling extreme anxiety since I graduated in 2005 with my Master’s Degree. Face numbing, teeth chattering, panic attacks at the thought of the weight of my student loans. I now have 104,000 (that’s with the ballooned interest) in federal loans and I will NEVER be able to pay it off with the career I chose after graduation (nor will they be forgiven without tax implications). I struggle every day, feeling as though I am a burden to my husband and any future children we may have. I know the math seems daunting, but nobody can predict the future. That amount of debt is possible to pay off, and even if you get taxable forgiveness, you’re ignoring the ability to claim insolvency. We estimate that 80-90% of borrowers pay little to no taxes on forgiveness via IBR, PAYE, RePAYE due to insolvency (we have an article coming up, but you can Google insolvency to better understand how it reduces or eliminates the tax burden). However, you need to get help if you’re contemplating suicide. Money is not worth your life. Call 1-800-273-TALK (8255) (the National Suicide Prevention Lifeline). Now that I am in my 50’s, I have my ‘valuable’ education, along with a masters, I am in an area of the country that is lacking large businesses (due to needing to remain close to my ailing parents – and being told by my eldest sister that since she is not within 5 hours, I needed to remain here.) I have not found a decent paying position for a female holding my creditials and education. I am working for a small firm that has apparently decided that I am now old enough that I would not be easily hired away, so my wages were dropped 1/3 a year ago, after nearly two decades with them. I am currently STILL looking for new employment, and realize I will be working for whatever days I remain on this earth. I have worked 7 days per week for decades, have had up to 3 jobs at a time for years. Even with credit that is good, there is the debt to asset ratio that impacts the ability to be a viable consumer in this economy – NO WAY is it a possibility to take part in life as a person that isn’t a drag on their family, their economy, etc. RECENT NEWS has disclosed there are federal bankruptcy judges that are seeking ways to help those seeking relief, such as removing any future tax payments. It’s been long coming – let us hang in there, PRAY & Keep up contacting our politicians!!! Hello, what if the loan has gone in collections with collection agency or deferred? How do you find out about the Pay as you earn repayment plan or the Revised pay as you earn repayment plan? Should you ask the collection people or who? Here’s our guide on how to get out of default and back on track with a payment plan. I have been struggling to pay my student loan debt for twelve years. There is no end in sight. I have to compartmentalize this as I would certainly have killed myself by now. Dealing with money and debt always triggers immediate and unrelenting suicidal ideations. The Holidays are hard as it is a broke time of year. I have two young children and a spouse and these are the ONLY reasons I have not taken my life and I struggle daily with ideation anyway. It could very well still happen even though I seek counseling and am taking medication. I see no hope for my financial future nor my children’s. The survivor’s PTSD that is caused by suicide keeps me here going to work every day although I am resigned to a hopeless existence. This nation is going to hell. Between medical and student loan debt we will continue to see no hope in the future. I have $215k. Yes, two hundred and fifteen thousand dollars. I have yet to find a permanent, full-time job. I’m a lawyer and my first job out of law school paid $36k. Now I’m working part time. I’ll be 40 years old this year. Yes. Suicide is my only option. Your loans can be dealt with. There are countless options, and you are still very young. Please talk to someone and get some help!